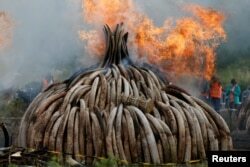 Ivory carvings and elephant tusks are lit on fire by firefighters for the first Cameroon ivory burn, attended by U.S. Ambassador to the United Nations Samantha Power at the Palais des Congres in Yaounde, Cameroon on April 19, 2016, to highlight the need to halt the Ivory trade in order to save Africa's elephants. Cameroon is making efforts to crack down on elephant poaching and ivory trafficking. Several recent busts have led officials to intensify surveillance at sea and in border areas. A man who complained to police at their station near the town of Campo on Cameroon’s southern border with Gabon and Equatorial Guinea was arrested alongside 45 other people although he insisted he was just a passenger aboard the ship. But Georges Mouncharou, Cameroon’s highest wildlife official in the area, said the ship had three containers of ivory on board weighing about 200 kilograms. The discovery was a bit of luck. Mouncharou said the ship ran out of fuel Tuesday and had to anchor in Cameroonian waters. The vessel was traveling from Gabon to Nigeria. Cameroonian officials noticed the ship while it was re-fueling and suspecting that it was owned by traffickers, they boarded it for a search. It is the first time Cameroon has found ivory on a sea vessel. According to officials, the people on board were from Nigeria, Benin, Cameroon, Gambia and Niger. A dozen have been detained for further investigation. 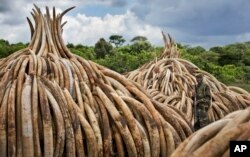 Kpwang Abessolo Francois, senior Central Africa program officer for the wildlife trade monitoring network TRAFFIC, said the tusks are believed to have been collected from elephants killed in Cameroon and Gabon. FILE - A ranger from the Kenya Wildlife Service stands guard near stacks of ivory in Nairobi National Park, Kenya, April 28, 2016. Asian countries are getting more appetite for luxury goods including African ivory as their incomes continue to rise. Francois said the black market price of African ivory has increased to $3,000 per kilogram and at that, traffickers from central African countries are ready to take the risk. He said traffickers cut the ivory up to hide it inside art objects or carpets, and even grind it up into powder form and put it in oil drums. Africa is experiencing unprecedented slaughter of the majestic animals, and Cameroon has been no exception. By one estimate, Central Africa has lost nearly two-thirds of its elephants since 2004. Cameroon has focused its efforts on national parks, even deploying the military to track down poaching gangs. Earlier this month, seven people with tusks from two dozen elephants were arrested at the Campo M'aan national park, also at the country's southern border. Joseph Achaleke, Cameroon's director of protected species and endangered wildlife, said there may be more maritime trafficking. He said they reinforced surveillance at sea and are working with neighboring countries to identify owners of the vessels and stop such illegal activity. But he says they rely very much on the population to inform them of suspicious activity. In April, Cameroon burned a large cache of seized ivory, including 2,000 tusks, as a show of force against poachers. The international ivory trade was banned in 1989.